The Otter first flew in 1951 and was a larger version of deHavilland’s successful DHC-2 Beaver. Initially the Otter was called the “King Beaver” but the name Otter was applied instead to the plane. Like the Beaver, the Otter is a large, no-nonsense bush plane powered by the Pratt & Whitney Wasp radial, which produces 600 hp. Many Otters have been converted to turbo-prop Pratt & Whitneys or Czechoslovakian made Walter engines. The Russian Antonov AN-2 biplane used a direct copy of the Wright Cyclone Nine R-1820 engine and now, in an ironic post-cold war twist, the Russian engine is approved for installation in deHavilland Otters. The Russian engine produces 1000 hp. This is an important development for operators of Otters, as Wright hasn't made the Cyclone Nine and Pratt & Whitney has not made the Wasp for many years. Parts availability for the Pratt & Whitney engine can be sparse. Otters are equally at home on wheels, floats or skis. Like many serious bush planes, Otters are highly prized by their owners and can be difficult to find in good condition on the used market. Given the shear size of the Otter, few, if any, are privately owned and most are operated by commercial operators. Prices on used Otters are extremely variable, but one can expect to pay in the mid six-figure range for one in good condition. The Otter served as the basis of deHavilland’s very successful Twin Otter. 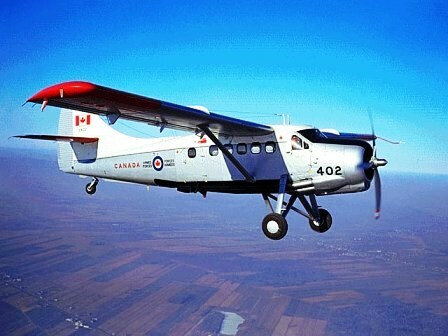 Neither plane is currently in production, however, Viking Air of Victoria, Canada owns the production rights to both aircraft and is planning to return the Twin Otter to production. Watch the Otter fly over the Grand Harbor in Malta and do a water landing. Impressive video from the cockpit. Larry from Sweden, who has been flying for over 45 years claims the Otter is his dream plane, although he thinks the Nordaviation N3400 is the best bush plane. Incidently, he found bush-planes.com while searching for information on the Dornier. If you'd like to vote on a favorite bush plane, go here.